The Industrial Remains of Long Pond Ironworks ~ The History Girl! The Highlands Region of New Jersey was once home to many industrious ironworks and forges. The forges at Long Pond, Ringwood, Midvale, Pompton, Bloomingdale, and Charlottenburg produced iron products for the young and quickly growing U.S. economy and even provided materials for troops during the Revolutionary War, the War of 1812, and the Civil War. All of these forges, with the exception of Long Pond, are no longer standing. Today, nestled within Long Pond Ironworks State Park, the remains of a colonial furnace and two Civil War era furnaces remind hikers, naturalists, and visitors of the rich ores once mined and smelted in this region of northern New Jersey, not far from the New York border. The remnants of the town left behind by progress and time are indicative of the immense operations that thrived and provided jobs to thousands over the course of their histories. Time has allowed much of this industrial landscape to be reclaimed by forest, but man-made progress is also evident by the expansive reservoirs which now provide drinking water to thousands in New Jersey. The quiet and desolate Long Pond Ironworks allows visitors to step back in time to imagine industry in a rural setting, unlike urban areas such as Paterson and Newark. 1860s furnace at Long Pond Ironworks. 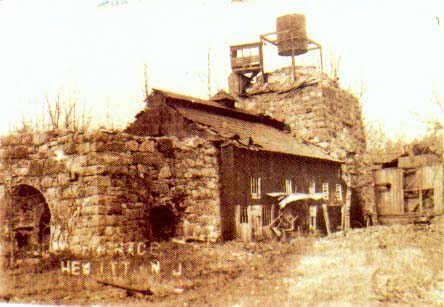 Mining began in what is today northern Passaic County as early as the 1740s, when Cornelius Board opened his forges at Ringwood and Sterling in the 1740s. However, the first ironworks established in the Highlands was a forge established in Whippany around 1710. Between 1760 and 1800, eighty-one forges and twenty-three furnaces were known to have been operating in the Highlands. An iron furnace is a stone structure, typically fifteen to thirty feet square at the base and rises anywhere from twenty-five to sixty feet tall. Iron ore was loaded into the top, along with charcoal or coal and lime. Normally, furnaces were built against a hill so they could easily be loaded from the top via a charging bridge, which would connect the hillside to the furnace. At the bottom of the furnace were at least two openings, called arches. One arch was called a blowing arch, in which air was forced into the furnace through a bellows, powered by a waterwheel, to raise the temperature high enough to melt the ore. The other arch was called a casting arch, where the molten iron could be tapped out onto the casting bed. Constructed of sand, the casting bed allowed the molten iron to flow into shallow troughs cut into floor. Usually, furnaces produced rough iron bars called pigs. The pig iron was either shipped to another portion of the factory complex to be made into finished products or shipped off-site. In 1766, German ironmaster Peter Hasenclever founded Long Pond Ironworks and eventually opened fifty-three mines within the surrounding area. With financial backing from British investors, Hasenclever purchased the existing Ringwood Ironworks as well as large tracts of land, including the 55,000-acre Long Pond property. Hasenclever imported more than five-hundred European workers and their families to build ironmaking plantations at Ringwood, Long Pond, and Charlottenburg in New Jersey and at Cortland in New York. These imported workers carved roads; built forges, furnaces and homes; and created supporting farms in the area. At Long Pond, they dammed the river in order to provide water power to operate the air blast for a furnace and a large forge. 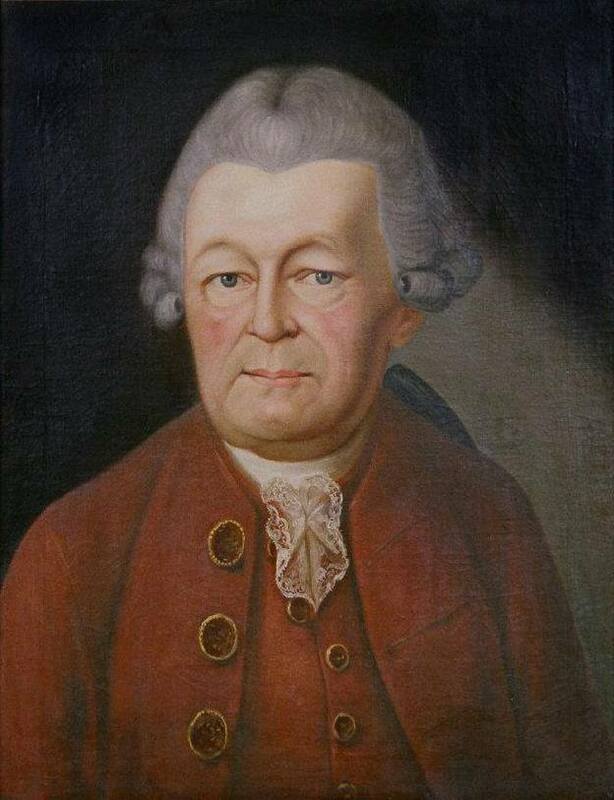 German ironmaster Peter Hasenclever, 1716-1793. After a few years, Hasenclever's investors viewed his plans as too grandiose and expensive. In 1769, he was replaced as ironmaster by Jeston Humfray, and in 1771 by the Scottish scientist and inventor Robert Erskine. Erskine served as surveyor-general to General George Washington during the Revolutionary War. He kept the ironworks in operation and they became important suppliers of armaments and goods to the Continental Army. As many as one hundred to one hundred twenty-five were employed by the forge. Many of the work force included local Ramapough Indians. Subsequent generations of the tribe worked at the forge through the 1880s and continued living in the village and surrounding area well into the twentieth century. Erskine died in 1780 at nearby Ringwood and the ironworks changed hands multiple times. In 1807, the property was purchased by Martin J. Ryerson, owners of the Pompton Ironworks. The Ryerson family operated the forge until 1853, when, the American industrialists Peter Cooper and Abram S. Hewitt purchased Long Pond and operated it as part of their vast, Trenton-based iron empire for the next thirty years. It was during this period that the ironworks saw growth, with the addition of two new furnaces, waterwheels, and a casting house. The village also experienced growth, with new worker's homes, manager's home, and renovated company store. At this time, as many as six hundred were employed at Long Pond. Within ten years, the Pennsylvania coal fields and iron mines of the Great Lakes region had become a more cost-effective source of fuel and ore. Hewitt planned to update the ironworks with cost-saving improvements such as a fifty foot waterwheel, but only the large pit was constructed. Like many others, Hewitt's business was affected by the Panic of 1873 and the large wheel pit was never completed. Finally, on April 30, 1882, the fires were extinguished, ending more than 120 years of ironmaking at Long Pond. A view of the furnaces at Long Pond, circa 1900. Courtesy: Friends of Long Pond Ironworks, Inc.
After the furnace's closing, mining continued to be a major industry and employer in the region. Other industries included a sawmill, ice-cutting, and recreation. But by the 1950s, these industries were in decline and many residents of the Village and surrounding area were moving to more populated areas where modern factories and industries were located. In 1957, the Ringwood Company donated the 175-acre Long Pond property to the State of New Jersey. The Long Pond Historic District was listed on the New Jersey and National Registers of Historic Places in 1974 and designated a National Historical Landmark in 1978. Long Pond Ironworks was dedicated as a New Jersey State Park in 1987. Today, only a small portion of the grand operation at Long Pond remains. What was once a village housing hundreds of workers is just a mere handful of buildings and ruins. These structures are in varying states of preservation and decay due to budgetary constraints. The only fully restored building at Long Pond Ironworks is the visitor center and museum. This building was originally built one-third of its current size as a two-family worker's cottage. This two-story, two bay home is believed to have been built during the 1860s, although its original date of construction is unclear. It would have been a mirror image of itself on each side of the center wall, where a staircase would lead to two rooms upstairs. The first floor would have contained a kitchen and multi-use rooms. The center portion and right side were added in the late 1920s, when the old Company Store relocated from the center of village to Greenwood Lake Turnpike. This allowed them to sell gas, maps, and other general store supplies to travellers. It was renamed as Ye Olde Country Store and operated through the 1950s. In the 1960s, the building was occupied by a restaurant. Double Stone House at Long Pond Ironworks, circa 1760. The village contains a number of homes. Just a short walk from the visitor center is Stites and Laird-West homes. These buildings date to the 1860s, but portions of the Laird-West House may be older. After a short walk from these homes, a green appears with three homes. However, only one of the homes is in its original location. The Harty-Milligan House in the center is a two-story, two bay, and worker's cottage that dates to 1861. It is similar in design to the left side of the visitor center, capable of housing two families. The other two homes in this area were relocated to Long Pond in 1985. The Monsville Reservoir was flooded shortly thereafter. The Patterson House, circa 1780, and the Whritenour House, circa 1810, were privately-owned satellite farms that provided goods and services to those living in Long Pond. The Patterson House served as a restaurant in the twentieth century under names such as the Wanaque Valley Inn, the Copper Kitchen, the Paul Bunyan Inn, and the Holy Mackerel Seafood Restaurant. As you continue down Furnace Road, deeper into the Village, there is a stone house, which is possibly the oldest home in the Village. It is believed to have been built in the 1760s. Its style mimics the Harty-Milligan House and the left side of the visitor center, although it dates roughly one hundred years earlier. Its exterior is composed of large, rough-cut stones. Unlike the other two, two-family worker's cottages, this one was not covered in stucco. The home suffered a fire in 1983, destroying the roof and second floor. A grant in 1995, rebuilt the roof and repaired the stonework. At the crossroads in the center of the Village are the ruins of the Company Store. The building, shortly after the 1760s, was constructed of fieldstone and later covered in stucco. It was two-and-a-half stories in height, three bays wide with an entry door in the center flanked by two windows. The front half of the building included a cellar, accessible from the left side of the building. Rather than issuing scrip, the workers purchased goods under a credit system, whereby their purchases were deducted from their pay. The store would have offered basic necessities such as salt pork, liquor, tobacco, and linens. The ironworks also had offices on the second floor of the store. Historians believe that the building was rebuilt in the 1860s. The store operated until 1925 when it moved to a new building on Greenwood Lake Turnpike. To the right of it are the ruins of an ice house. Built into the hillside and about two feet into the ground, the ice house provided a location to store ice harvested from nearby ponds. The roof of the icehouse was most likely covered with thatch. Behind the road in front of the company store is a manager's house and a worker's house, both of frame construction. These homes date to the 1860s and sit abandoned, in varying states of deterioration. The remains of the late 1870s/early 1880s waterwheel at Long Pond Ironworks. Burned in 1957. No more than a quarter mile from the company store lies the heart of the ironworks, the blast furnaces. Three iron furnaces remain, dating between 1766 and 1865. The original furnace, constructed about 1766, is an archaeological remain, rising only a few feet high and is now covered with a tarp to prevent further deterioration. When in operation, it rose about twenty-five feet tall and produced 25 tons of iron weekly. The other two furnaces were built during the Civil War. One of the furnaces produced high-quality iron for gun barrels used by the Union Army during the Civil War. Compared to the colonial furnace, these could produce as much as 150 tons of iron weekly. Toward the end of the Civil War, the second furnace was constructed and the two were connected by a large three-story casting house, of which only the foundation remains today. This second furnace was nicknamed "Lucy" by the workers and converted in the 1870s to burn anthracite coal. Shut down in 1882, "Lucy" was the last furnace at Long Pond to operate. Associated with the furnaces are two waterwheels, built in the late 1870s or 1880s. Fires in the 1957 heavily damaged them. One was rebuilt in 1996 on its original axle through a Green Acres grant, while the other has been stabilized in its current condition. These waterwheels, twenty-five feet in diameter, harnessed power from the Wanaque River via a stone raceway and iron pipes to power the furnaces. These remnants of the industrial past at Long Pond signal the once-great strength that northern New Jersey and the Highlands played in the economic development and Industrial Revolution of the United States. Plentiful ore still remains buried under the soil in this region, which has now become a haven for passive recreation and an important source of drinking water for millions of residents. The continued preservation of not just the historical resources, but also the ecological resources will play a vital role at Long Pond well into the twenty-first century and beyond. The remains of the 1873 waterwheel pit at Long Pond Ironworks. Very interesting, hard even to imagine the extremely intensive and mostly hand labor that went into the production of iron. I also nominate Kelly for Ambassador of History in the State of New Jersey. Nice one! Those interested in this area should check out the oral history tapes by Louis West at the Ringwood library: http://www.ringwoodlibrary.org/links.shtml He was a family friend and chock full of good information. Interested in finding out the history of the Harty-Milligan house as well if there are records of the workers who worked at the site. Related to the Harty's from Stonetown and having a hard time finding information on them. Thank you so very much for your thorough and in-depth article on one of my personal favorite historic sites in NJ. I would like to add a Note: "The original furnace, constructed about 1766, is an archaeological remain, rising only a few feet high and is now covered with a tarp to prevent further deterioration. When in operation, it rose about twenty-five feet tall and produced 25 tons of iron weekly." I was a member of the archaeological dig that uncovered this furnace in the Spring of 1967 lead by the Anthropologist Dr. Margaret Mead. We were a group of about 50 8th grade students from Ridgewood NJ, Lloyd Ashby-Superintendent. There was a retreat named "Camp Green" on the Ringwood Manor (just South of the Manor Mill Pond). We bunked in houses named "Erskine House" at the end of what is on google maps "farm road". Our dig uncovered the walls of the furnace and the crucible. We marked out the walls and pig iron pits for the rooms where the iron was drawn off just to the South of the Furnace. Dr. Mead also lead us on a walking exploration of a mine she believed was of Revolutionary Era adjacent to what is now the IBM facility in Sterling Forest. It has since been filled by Mahwah Ford and I fear like the Peters Rd mine which we also explored to a small extent is toxic. The waterfall and whirlpool on the stream were also studied and we found iron pins in the rock above the waterfall which Dr.Mead speculated could be anchors for boards to dam the stream for water to the power the iron works. It was a fascinating week and Dr.Mead was completely involved with our group, even eating her dinners with us in the cafeteria. I am a direct descendant of Henry Oliver Whritenour (originally spelled "Reitenauer") who came from Darmstadt, Germany in the 1760's to work for Peter Hasenclever at Long Pond Ironworks. There are many Whritenours who still live in Northern New Jersey to this day.